Studies show that sometimes the strongest craving for food occurs, when people are under stress, or emotionally unstable. Many people turn to food for comfort - consciously or unconsciously - when they're facing emotions, such as stress, anger, anxiety, boredom, sadness or loneliness. 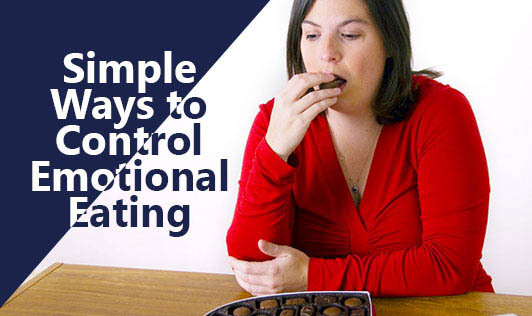 Most often emotional eating leads to eating excess food, especially food that is high in calories and fat. When emotions determine your eating habits rather your stomach, it can quickly lead to overeating, weight gain and guilt. Learn to identify your triggers Figure out what really causes you to overeat. Limit trigger foods Simply stop stocking your fridge and pantry with the foods you binge on. Keep a food journal Logging your food will help to identify your toughest timeframes. It will also make you accountable, so perhaps you'll be less apt to reach for unnecessary food. Exercise regularly Daily exercise relieves stress and puts you in a positive mindset, which provides greater strength to pass on the unhealthy fare. Get enough sleep Research shows that sleep deprivation can increase hunger by decreasing leptin levels, the appetite-regulating hormone that signals fullness. Furthermore, with adequate sleep, you'll be less tired and have more resolve to fight off the urge to grab foods for comfort. When you trip up -- because you will (We all do! ), don't give up. Forgive yourself and start over the next day. Learning from your mistakes and focusing on the positive will go a long way making a healthier - YOU !! !